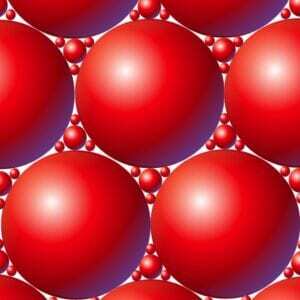 Particle packing is taught as part of basic materials processing courses at engineering schools. An understanding of the basics allows us to better evaluate and choose our potting medium ingredients. Lets start with the very basic aspect of particle shape. 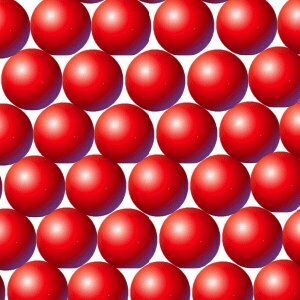 Perfect spheres offer the least-dense packing scheme, with approximately one-third of the volume being free void space (you can do the math for yourself). Any deviation from the perfect sphere, and a particle intrudes into the nearby void space, reducing its volume. To further demonstrate the importance of particle size uniformity, let’s look at an example of just the opposite – trying to make a very dense body, as one might do when manufacturing a brick. In reality – for both bricks and potting media – the particles are not perfect spheres, are not uniformly sized, consist of more than just three distinct particle sizes, and are not ideally mixed so they can stack precisely, so the packing is not uniform throughout the volume. OK. So what are the implications of those factors to potting medium? When blending medium components, it is best to try to keep the particle sizes as close to the same as possible, so there is a maximum amount of free space available for air flow. You’ll never get it exact, but blending 1/4″ perlite with 1/2″ bark and charcoal is not as good as using 1/2″ perlite. The smaller the void spaces, the more likely that water can be trapped between saturated particles due to its surface tension, bridging the voids and cutting off air flow. That, by the way, is the reason that we often hear recommendations of “let the medium dry between waterings”. Doing so allows the “bridging” water droplets to evaporate or get absorbed so that the medium can “breathe” again, not because of the incorrect assumption that “water causes rot”. Size the particles so they are appropriate for the size of the roots. Despite the fact that the basketball and ping-pong ball example shows that the void volume will be equal, the sizes of those voids is considerably different. Roots growing into the voids can fill them as effectively as other media particles.